We are a community of people who value principals, guidance, learning and support. We see fitness as an outcome of smart, appropriate training and a necessity for an active life. We are men, women, mothers and fathers, professionals, college students and retirees from walks of life and at many varying stages of fitness. Our commonalities are what fuel our desire to train. We train in order to move better, get stronger, and improve our quality of life. Comprehensive strength and conditioning program designed for training 3-4x week. Fundamental movement patterns including a hinge, squat, and press are taught and progressions given to achieve proper body alignment in order to make these patterns as effective as possible. 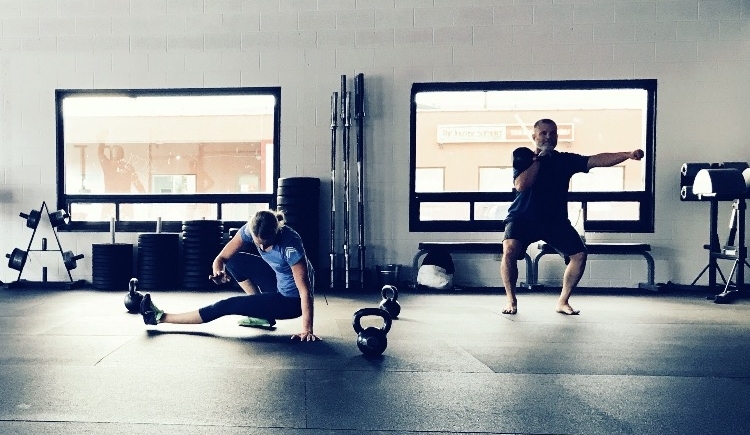 Kettlebells, barbells and bodyweight movements are combined to strengthen those fundamental movement patterns both in and outside of the gym. Conditioning is applied appropriately with attention to risk/reward levels including the intent and desired response from the program. Private one-on-one sessions can be scheduled for assessments, as an introduction to training, ongoing training as well as techniques sessions. Private sessions value the same principals as our group sessions but in a more personal setting. Specific plans can be implemented to achieve goals and assess progress using an individualized approach. Through assessment and repeated testing, programming is designed to reach specific goals. This is suitable for someone with a more extensive training history who feels comfortable training on their own. Session plans will be delivered weekly and includes session details as well as a channel to record, communicate and archive results and videos. Goal specific nutritional consulting is included and strongly encouraged. Ongoing monthly nutrition counsulting. Weekly check-ins based on individualized accountability plans and appropriate goal setting. Private one-on-one sessions can be scheduled for assessments, as an introduction to training, ongoing training as well as techniques sessions. Private sessions value the same principals as our group sessions but in a personal setting. Specific plans can be implemented to achieve goals and assess progress using an individualized approach. 30 min sessions can be scheduled to discuss, assess, and/or practice specific skills or goals. These sessions can include but are not limited to mobility, strength, technique and nutrition goals. The more specific you are with your focus and intentions, the more successful you will be. Please contact us with any questions about our program or our community.